The Library at UBC’s Okanagan campus invites applications from recently graduated, innovative, enthusiastic, service-oriented librarians for a 0.75 FTE, 1 year fixed term position as Librarian, Southern Medical Program. The successful candidate will be a key member of UBC’s distributed medical program administered by the Faculty of Medicine and will have specific responsibility for library services associated with the Southern Medical Program located at the Okanagan campus of UBC. Reporting jointly to the Associate Chief Librarian at the UBC Okanagan Library and the Regional Associate Dean, Interior, the Librarian, Southern Medical Program, provides leadership in the creation, development, and delivery of instructional programs, collections and services to the students and faculty involved in the Southern Medical Program. The Librarian, Southern Medical Program, is active within the Faculty of Medicine, working closely with colleagues at UBC’s Vancouver campus, the University of Northern British Columbia and the University of Victoria. The successful candidate will be a key collaborator at teaching hospitals and clinical sites within the Interior Health Authority. The Librarian, Southern Medical Program, prepares and monitors the annual budget for library collections and services for the Southern Medical Program. Supervision of a library assistant may be required. The Librarian, Southern Medical Program, will also contribute to reference services and participates in the overall planning for library services and spaces at the Okanagan Campus Library. They will also assume liaison duties in Human Kinetics and Biology. Required: A graduate degree from an accredited school of Library, Archival and Information Science; knowledge of library systems and applications; demonstrated competencies in reference and instructional methodologies in an academic, hospital or research setting, with an emphasis on evidence based practice; excellent organizational and analytical skills; excellent written and oral communication skills including the ability to communicate at a distance; proven ability to work well independently and within large and complex teams; commitment to developing professional knowledge and skills on a continuing basis; the ability and willingness to travel to various locations in British Columbia as required. Some weekend and evening work will be required. Preferred: Academic library experience; a background working in health sciences libraries and with emerging technologies; e-resource acquisition and evaluation experience. Reports jointly to the Associate Chief Librarian at UBC’s Okanagan campus Library and the Regional Associate Dean, Interior. Coordinates activities with other Librarians at UBC’s Okanagan campus and collaborates with Librarians throughout the UBC Library system. Works closely with colleagues in other units within UBC. Works with faculty, students, staff and the public. Provides in-depth reference service for medical sciences, assigned liaison subject areas, and participates in an on-call rota. Provision of these services may take place on campus or remotely, and will include services provided in relevant hospital or health authority settings. Liaises with SMP researchers and students conducting research. Participates in teaching in the Informatics program with a particular emphasis on information literacy and support of evidence-based practice. Develops web and print instructional materials for faculty and students, including web-based subject research guides. Participates in the general orientation and instruction programme. Provides health sciences related instruction for reference librarians and assistants. Tutors a small group in the first year or second year case-based learning, as required. Selects appropriate material for the medical sciences reference and reserve collections. Develops a strategy for building knowledge of the reference and main collections and keeps abreast of new resources. Develops and reviews collections policies and vendor profiles on a regular basis. Undertakes self-initiated reviews of reference and general collections relying on established guidelines for withdrawal or removal to compact shelving. Participates on SMP and library committees and assists, as appropriate, in other short-term library projects. Participates on Library and University committees, councils, task forces and teams. Actively participates in and collaborates with UBC Faculty of Medicine to ensure a smooth transition of curriculum renewal as it pertains to library services and pilot projects in the Southern Medical Program. Develops and maintains an active, collaborative working relationship with the medical librarians in the partner hospital and university libraries. Develops and maintains an active, collaborative working relationship with SMP faculty, staff, and students on matters dealing with informatics, collections and reference activities. Develops and maintains an active, collaborative relationship with UBC librarians regarding the planning and provision of library collections, services and space on the Okanagan Campus. Develops, monitors and reports on accountability measures for SMP library services. Accepts responsibility for personal continuing professional education. Willingly develops skills beyond the job’s parameters and assumes appropriate leadership. Keeps up-to-date on developments in library service, resources and technology and on broader issues that affect the practice of librarianship. Participates in appropriate professional organizations. Undertakes research and engages in scholarship as appropriate. Monitors fiscal year expenditures of relevant departments/programs and deals with over expenditures according to established principles. Develops the annual SMP library budget in concert with other undergraduate medicine program librarians. Working with the SMP Financial Officer and SMP Administrative Director, prepares the draft budget request for submission to the Undergraduate Medical Education Executive (UMEX). Interprets and communicates UBC Library policies and procedures to faculty, staff, and students and keeps up-to-date on the latest library policies and procedures. Contributes to the policy and planning discussions in various forums as part of the Libraries’ strategic planning activity. Provides direction and manages staff performing functions of an administrative nature within the Library. Provision of effective and professional reference and research services. Development of in-depth knowledge of the collections supporting MD Undergraduate education including e-resources and web tools. Develops collections responsive to expressed needs of students. Develops and maintains effective and co-operative working relationships with support staff, colleagues and management, UBC faculty, staff and students and librarians in the health authorities. Strong collaboration with all librarians supporting the UBC Medical Undergraduate program. Develops and monitors accurate and effective budgets. Is flexible and willingly adapts to change. Employs innovative approaches to problem solving. Effectively focuses on important issues and balances responsibilities. Sets priorities. Maintains current knowledge of Library policies, practices and procedures and appropriately interprets them to staff and users. Awareness and effective application of trends in reference service and collection development in life sciences. Applications are to be submitted by 11:59 pm PDT on January 15, 2017. Accelerate Okanagan's reports on the $40.65-million investment at UBC Okanagan that will create jobs, support research and foster innovation. The Academica Group reports on UBC's upcoming Okanagan campus expansion, thanks to a joint federal-provincial and university investment. Okanagan Life reports that work has begun on a new $35-million Teaching and Learning Centre at UBC’s Okanagan campus. Thanks in part to a $10 million investment from students themselves, University of British Columbia’s Okanagan campus will soon have a massive upgrade to its Teaching and Learning Centre, reports Kelowna Now. Global News explores the $40.6 million funding announcement to build a teaching and learning centre adjacent to the UBC Okanagan library. Studying or working at UBC Vancouver or UBC Okanagan? As we look ahead to another academic year, UBC is taking this opportunity to re-engage with you on the issue of copyright. Copyright law is not static. Over the coming two years, we are anticipating several developments in copyright law that will require continued vigilance on the part of faculty, staff and the university administration. To promote best practices as the legal landscape develops, we have added an alerting system to Connect. The system will be implemented by individual Faculty through the rest of 2016. Currently, instructors are prompted to input metadata indicating the copyright status of an uploaded file. This system is intended to assist faculty in keeping track of the copyright status of their uploads, to ensure an accurate record of permissions is maintained over time, and as courses evolve. The new system will alert faculty members if any uploaded files are missing copyright metadata. This system also provides an opportunity for faculty members to review the material and remove any unnecessary content. To save time and effort, consider using the Library Online Course Reserves (LOCR) system, where trained staff will take care of scanning, uploading and clearing copyright on your behalf, including paying any required transactional license fees. As you know, UBC has also created various tools to assist faculty to learn about, to use and to distribute copyrighted materials in compliance with copyright law. 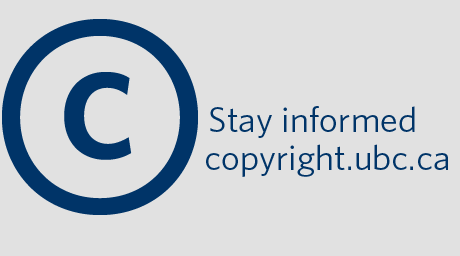 Further resources, as well as updates about changes in copyright law, can be found at http://copyright.ubc.ca. If you have any questions about copyright please email copyright.services@ubc.ca and consider attending a workshop: http://copyright.ubc.ca/support/workshops/. UBC remains committed to providing our academic community with the resources it needs to easily and legally access learning and research material. Thank you again for your efforts and support since we embarked on this course in 2011.